It's been a while since OpenOffice had an update. So long that Microsoft's SmartScreen security technology doesn't recognise the file as one that's commonly downloaded. After years as the main open source competition to Microsoft Office, OpenOffice has fallen significantly behind. There was controversy after Oracle bought Sun, which had open sourced the code for StarOffice as the basis of the project, and most of the developers moved to The Document Project to work on competitor LibreOffice. Both versions use the same underlying code but, despite Oracle handing OpenOffice to the Apache Software Foundation and recruiting developers behind IBM's short-lived Symphony - LibreOffice has had more updates and replaced OpenOffice in many Linux distributions. Now OpenOffice has its first major update since 2011, Apache OpenOffice 4.0 for Windows, Mac and Linux. It promises hundreds of bug fixes, better compatibility with Microsoft Office documents, support for more languages (including Greek, Portuguese and Tamil) and interface changes that come directly from Lotus Symphony. The OpenOffice team is pitching it as a possible solution if you're still using Office 2003, which like Windows XP will no longer receive updates and security patches after April 2014. So is it worth choosing the new OpenOffice over Microsoft Office or the newly updated LibreOffice? Installing OpenOffice used to require the painstaking gathering of installer files, dictionaries, help content and add-ons by hand. 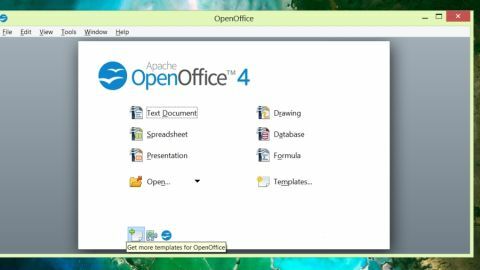 OpenOffice 4.0 has a single installer that adds most of the Windows components you need and walks you through making it the default software for Word, Excel and PowerPoint files. You can choose which programs to install (though there are few other options), which makes this like most other modern software packages. But it's disappointing to see it flagged as insecure by Microsoft's SmartScreen and Apple's Gatekeeper because it's not properly signed; when security is so important that's something no professional software should do. And if you want to use Base database software on Windows, you'll need to install Java yourself; again, something we'd expect the installer to do. OpenOffice 4.0 has five main programs; Writer, the Calc spreadsheet, Impress presentation software, Base and Draw, plus Math, a formula editor. They have broadly similar features to the Office equivalents of a few years back, with some decent business tools: macros and pivot tables in Calc, tables, DTP tools and comments in Writer, and master pages and presentation tools in Impress. But you don't get clever features like suggestions of the best chart for presenting data, as with Excel, or the ability to search and place images from the web straight into a presentation, as with PowerPoint. The interfaces are the same rather cluttered collection of menus and multiple toolbars as OpenOffice 3.3 (which look somewhat dated but take up a little less space on screen than the expanded ribbon in Office 2013 programs), plus the 'new' sidebar. This is a context sensitive panel at the right of the screen that shows the properties for whatever you have selected so you can quickly make changes; you can resize the panel, undock it and drag it elsewhere on the screen or minimise it to a bar of icons. The sidebar also provides a home for other frequently used panels; the image gallery, the styles and formatting pane, the function pane in Calc, the master pages, animation and transition panes in Impress and the document Navigator that displays a map of your document. This isn't really new; it's rather like the panels in Photoshop or the task panes in Office 2003. Office 2013 has its own context sensitive task panes – but they only appear when you select specific objects that have a lot of options to set, like formatting an image or choosing fields for a PivotTable. The OpenOffice 4.0 sidebar is there all the time (unless you close it). It doesn't show you all the properties you can change (for example, if you have a date field that updates automatically, you only see the usual text and paragraph formatting options, not the ones to change the date format). And sometimes a toolbar pops up on screen with some of the same tools as the properties sidebar and extras; like the Picture toolbar to change the colour of an image (which you can do on the sidebar) or flip its orientation (which you can't). It's a useful way to get common tools that are often hard to find in the toolbars and menus, but it's frustrating that more of the OpenOffice tools are not exposed this way. For example, you can change the layout of a slide from the sidebar in Impress, but you can't pick a different bullet for a list. It's only useful if you have a large screen or work in documents full-screen; once you put two documents side by side there is rarely room to see the sidebar as well. Other interface changes are definite improvements. The new colour palette has a larger selection and they're arranged in clear order, so it's easier to spot the pale blue you're looking for. The range of colour gradients still includes the old, rather garish multicolour selection, but adds more useful grey, yellow, orange, red, pink, blue and green gradients. The print preview is much closer to what you'll get on paper, especially for graphics; and there are similar improvements when you paste and draw bitmap graphics, with none of the jagged lines we've previously seen on diagonal lines and curves. You can also paste in SVG and other vector files and keep properties like transparent backgrounds and alpha layers, instead of them being converted to bitmaps with a white background. Even if you use OpenOffice 4.0 exclusively, you're going to need to exchange files with Office users. OpenOffice has always had basic compatibility with Microsoft Office formats, and this release does better at preserving fidelity in your documents for bulleted and numbered lists, tables of contents, outlines, graphical and coloured backgrounds in objects, shapes with text in, 3D shapes, charts and other areas where there have been problems in the past. These are welcome improvements, but we're still not confident that OpenOffice can open the most complicated Office documents and get them pixel perfect every time. OpenOffice 4.0 also fixes a bug in OpenOffice 3.3, which prevented you opening files in Office if you'd password-protected them in OpenOffice. You can now exchange password-protected files between the two, as long as you save them using the Office file formats. Once you password-protect a file in the OpenOffice file formats it can only be opened OpenOffice. And oddly, when we password-protected an Excel file in Calc and opened it in Excel 2013, we were able to type in the password and view the file, but Excel warned us that the file might be dangerous. That might be because of the unfriendly way OpenOffice 4.0 supports Office's XML file formats. You can open files in the modern XML Office formats (XLSX, PPTX, DOCX) and save any changes; but you can only save new files in the older binary Office file formats (or ODF and OpenOffice formats). The default setting in recent versions of Office is to warn you that files in these binary formats can be unsafe, and this could cause confusion when you exchange files with partners and customers. The complicated and confusing history of OpenOffice has been reflected in the slow pace of updates - largely because the open source developer community has been more enthusiastic in backing LibreOffice - and the dated interface of previous versions. When an open source software project becomes unpopular, it can end up fading away. LibreOffice is a popular and well-supported project and, despite all the infighting, the backing of the Apache Foundation is likely to ensure the continued development of OpenOffice. If it suits you, you should be safe picking it. Bear in mind though, that your business users are probably already familiar with Microsoft Office. Before you consider a switch to OpenOffice find out whether any of them have used it before and how much retraining you'll have to factor in. Even simple things make a difference. Although there are icons for each of the separate programs, when you use Writer, Calc, Impress and Draw together all show up as a single icon on the Windows taskbar, so it's not as easy to switch between a spreadsheet and a presentation. Also, if one of the programs hangs, you can't carry on working in the others while it recovers. While performance is generally good, opening documents in Office file formats can be unusually slow, and there is an issue with document templates. When you open any of the Office 2013 applications, you can create a blank document, select recent templates or pick from the huge number on the Office.com site, which you can search and preview. In OpenOffice, if you know that the tiny icon on the OpenOffice launcher is a link to the comprehensive OpenOffice template site, you can jump straight to it to browse for everything from business cards to tenancy agreements. But the launcher is only available when you don't have any OpenOffice applications open; after that you have to find it from the new document dialogues and wizards in each app. For example, there's a link in Writer but not in Impress, and when you pick a template on the site, you don't get a new document based on the template, but a ZIP file with no instructions on where to save it. It's a small thing, but it could mean the difference between getting a document finished quickly and spending time working out how to use a basic feature. And it adds to the overall impression that OpenOffice feels competent and basic rather than impressive.